Last night Bryn suggested we go out to eat. We never go out for dinner here. 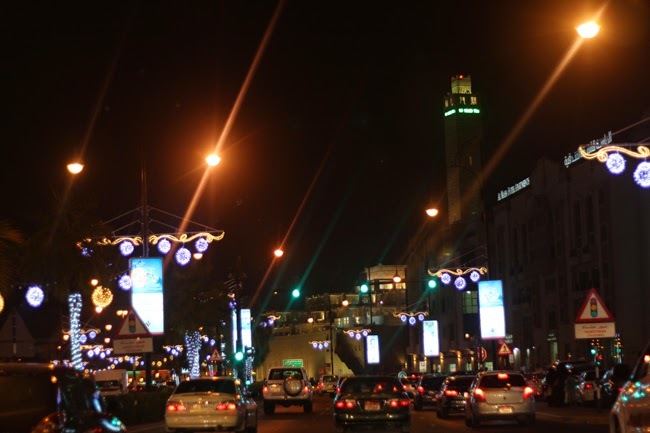 The roads are even crazier than normal at night, and with the UAE's laws only one of us can have a drink, so we'd rather stay at home and both have a glass of wine or beer with dinner. It's usually just not worth it. But, we broke away from our routine last night and made our way to the Hilton to have dinner at Toki, a Japanese izakaya. It was a lot of fun to have some izakaya style foods that we haven't had since we were in Japan, but I'll tell you more about that another time. 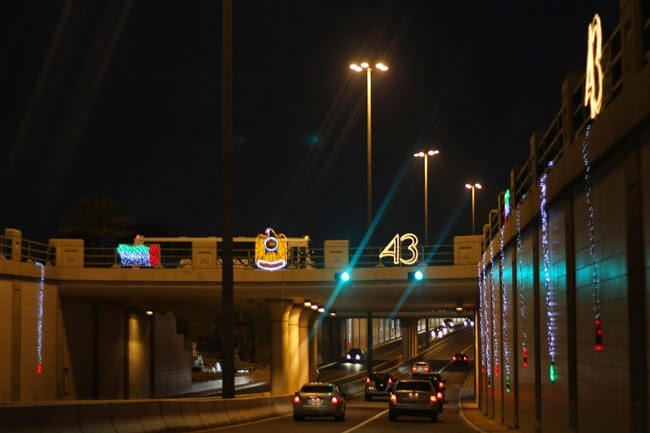 Today I wanted to show you how Al Ain is lit up. 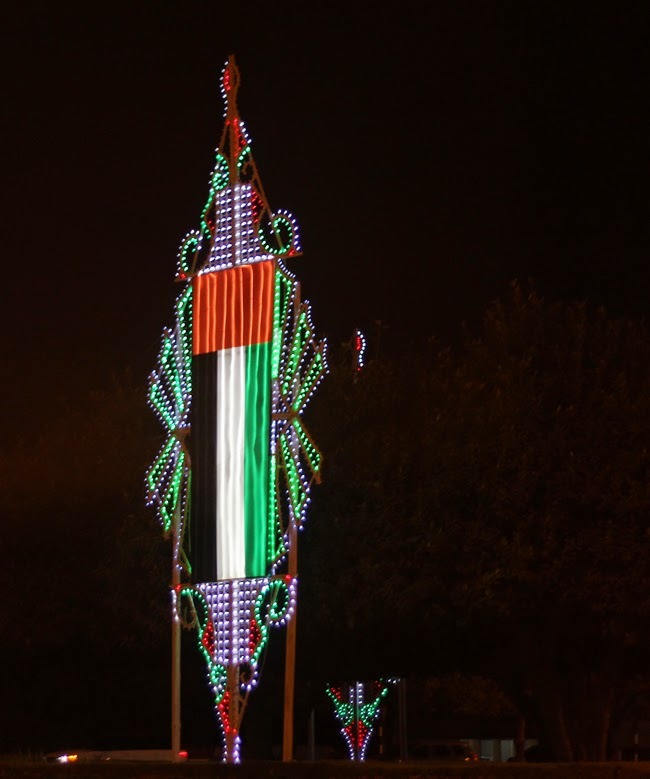 The UAE's National Day is at the beginning of December, and this place goes all out. There are enormous flags everywhere. 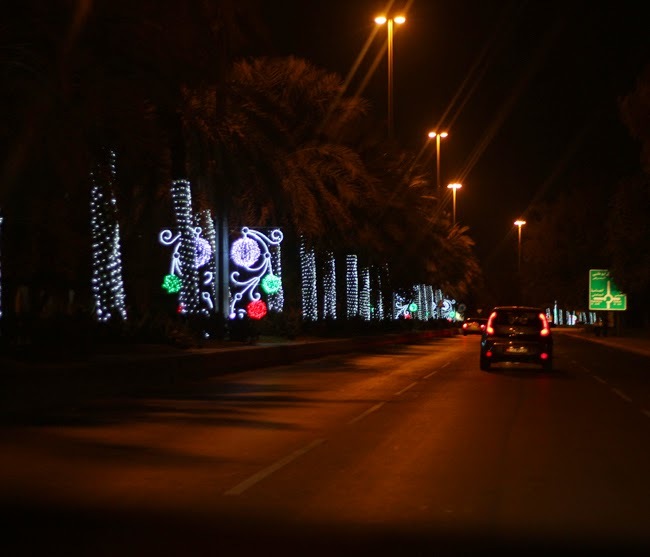 Every shop has red, green, black and white streamers and decorations up, and the streets and round-a-bouts are decked out with extravagant light displays. 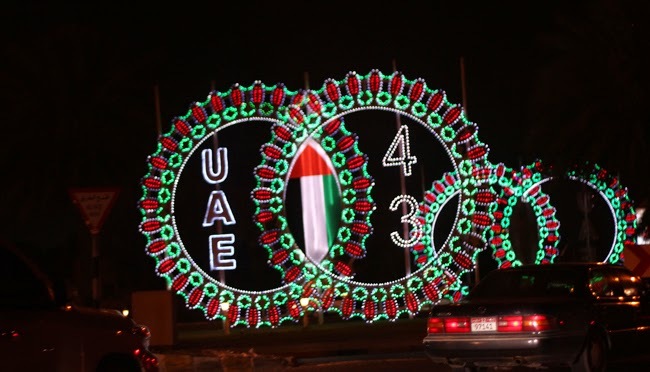 Since I make it my mission not to leave this apartment after dark here, I rarely see the National Day lights, but we got to see them last night. I'm in two minds about these lights. Of course they are festive and pretty (and it doesn't hurt that they are mainly red, green and white which gives them a Christmassy feel!). However the last thing the drivers in this country need is another distraction!! I've driven in lots of countries, and this one, by far, has the worst driving I have ever come across. It's unbelievable. Now add huge things to look at all around you - it's an accident waiting to happen!! Anyways, I snapped away while Bryn drove. It was no easy feat since it was dark and we were moving fast, but I managed to get just enough shots to show you the effect! I'm going to be spending my Thursday making coffee ice cream for tomorrow's dessert. Tomorrow I have to make a big batch of red beans and rice and I'll be baking bread (we have company coming over for dinner). Fingers crossed we can squeeze in a Friday morning matinee of Mockingjay!